Should You Use the Windows 10 Insider Previews? By switching to Insider Preview builds of Windows 10, you’ll get the latest changes and features before other Windows users. However, you’ll also get new bugs. Here’s what running an Insider Preview is actually like. Overall, we don’t recommend switching to Windows 10’s Insider Previews on your main PC, or any PC you depend on actual stability from. 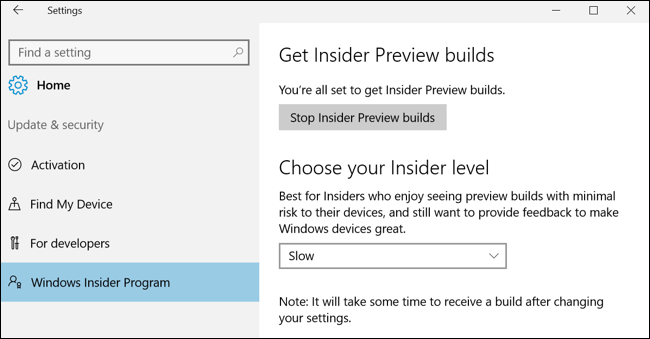 if you’re curious to get a glimpse of the future and provide feedback, we recommend running the Insider Previews in a virtual machine or on a secondary PC. Insider Preview builds get you the latest Windows 10 features before they’re ready for the general public. Insider Preview builds have the latest features and changes, but they also aren’t completely stable. Microsoft releases these in-progress builds to “Windows Insiders.” These “Insiders” can test these builds and report bugs they experience and provide other feedback. There are several different Insider “rings” to choose from: the Fast ring, the Slow ring, and the Release Preview ring. They’re called rings because builds start at the fast ring before making their way out to the slow ring. The Fast ring will receive the most regular updates and offer the latest software. it’ll also be the least tested and the most unstable. This is the riskiest ring to choose. Some builds will occasionally make it from the Fast ring to the Slow ring. Not every build will make it from the Fast ring to the Slow ring, as builds that reach the Slow ring are supposed to be more tested and stable. This is a safer bet, but we’ve still experienced flakiness with Slow ring builds. There’s also now a “Release Preview” ring you can choose. 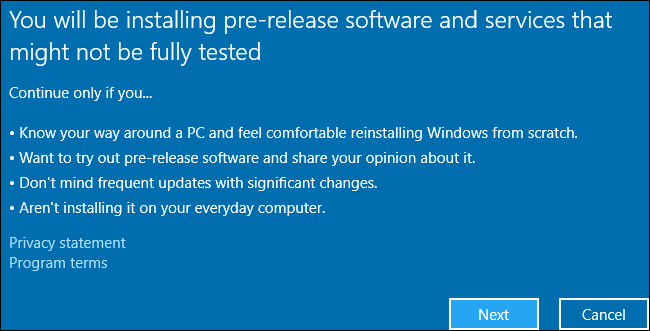 This will never actually update you to a new “build” of Windows 10. Instead, it just provides early access to basic Windows updates, drivers, and updates to Microsoft applications from the Windows Store. It’s less risky, but you aren’t actually getting any access to the next build of Windows 10 Microsoft is developing. When considering using an unstable operating system, it’s important to realize what “buggy” actually means. It doesn’t just mean that the new features don’t work properly. It means that Windows itself can have serious bugs. These bugs could make your desktop applications not work properly, or cause certain hardware not to work as expected. Windows itself may freeze or crash. Basic operating system components like the Explorer desktop shell and the Start menu may experience issues. The exact problems will depend on which build you’re running, which hardware you have in your PC, and which programs you’re using. The level of bugginess tends to fluctuate over time. At the moment, Microsoft is working on polishing up the Anniversary Update. The Insider Preview builds seem much more stable than they did a few months ago. After the Anniversary Update launches, the Insider Preview builds will likely become buggy again, as Microsoft works on the next big update. So where you are in the release cycle matters, too. It’s easy to opt into Insider Preview builds—you just need to toggle the option in the Settings app, choose a ring, and wait a bit for the new build to be delivered over Windows Update. Anyone can become a “Windows Insider” for free with a Microsoft account and a few clicks. However, if you ever want to leave an Insider Preview ring, you could have some trouble. There’s no guarantee that you can downgrade from an Insider Preview ring to an older stable build. There’s a way to temporarily downgrade to a previous build if you experience a problem, but that option is temporary. You’ll often have to reinstall Windows 10 on your PC–or restore from a disk backup–if you want to go back. This is one of the big reasons we really don’t recommend upgrading a PC you actually use to Insider Preview builds. It’s too hard to downgrade if you experience a problem. There are good reasons for some people to use Insider Preview builds of Windows 10, of course. You may want to test the latest builds to check for bugs and provide your feedback to Microsoft via the Feedback app. That’s what Microsoft is hoping for–lots of people to use these builds and function as a free army of quality assurance testers. You may also want to get your hands on the latest features and changes before they reach a wider audience. That’s what we use them for here at How-To Geek, so we can look at–and write about–the latest changes in Windows 10 while they’re still in development. If you’re a developer, you may want to test new Windows features before they become stable–for example, Microsoft’s Win32-to-UWP application converter, will officially launch with the release of the Anniversary Update. Should you use Insider Preview builds? That’s up to you. We don’t recommend upgrading your main PC, though, or any PC you actually depend on to get things done. We’ve experimented with running Windows 10’s Insider Preview builds on our main PCs, and it didn’t work out well with the odd bugs that can crop up during Windows 10’s development. But, if you do have a PC lying around that you don’t need for anything else, and don’t mind its software being potentially unstable, feel free to upgrade it to the Insider Preview builds if you’re curious. Better yet, install Windows 10 in a virtual machine–for example, using VirtualBox–on your existing computer. You can then upgrade to Insider Preview builds inside that virtual machine, allowing you to play with the latest software without your computer being at risk for bugs. After all, you don’t even need a product key to install Windows 10 in that virtual machine, which is very helpful for testing.